Posted on Tuesday, February 28th, 2012 at 7:09 am by Pieter van der Westhuizen. Microsoft Outlook regions are cool. It offers developers the ability to add their own custom functionality to the standard Microsoft Outlook Inspector or Explorer windows. 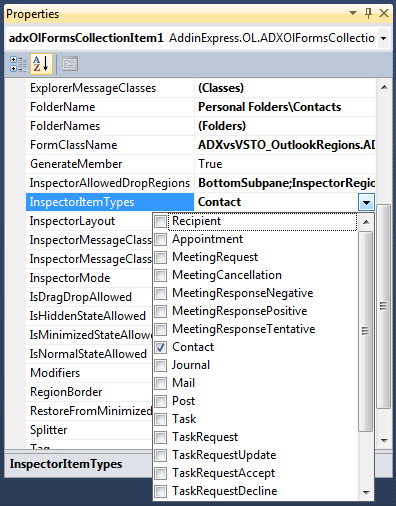 VSTO provides a fairly respectable Outlook Form Region project item template for use in Visual Studio. The Outlook Form Region template does give you the option to either design a new form or import a form that was designed in Outlook (.ofs). Replace-all region: Replaces the entire form. c) you choose which built-in or custom message class the region should be displayed for e.g. Contact (IPM.Contact). Right and Left sub-pane: Similar to Adjoining but docked to either the left or right of the inspector window. Things get really interesting with the different options Add-in Express provides when it comes to Outlook Explorer regions. I could not find VSTO equivalents to most of the regions Add-in Express provides other than the reading pane and even then with VSTO you only have the option to use Adjoining, Replacement and Replace-all. Whereas with Add-in Express you are able to dock your form region to the reading panes’ top, bottom, left and right as well as completely replace it. Top sub-pane: Your form is docked above the list of e-mail messages in the Inbox folder. Bottom sub-pane: Docked under the list of e-mail messages in the Inbox folder. Right sub-pane: Docked to the right of the list of e-mail message in the Inbox. Left sub-pane: The form is docked on the left hand side of the e-mail message list in the Inbox folder. Web view pane: Replaces the entire view with your form. This means the list of e-mail messages as well as the reading pane is replaced with your form. Bottom Outlook bar: Docks your form below the Outlook Bar in Outlook 2000 and 2002. 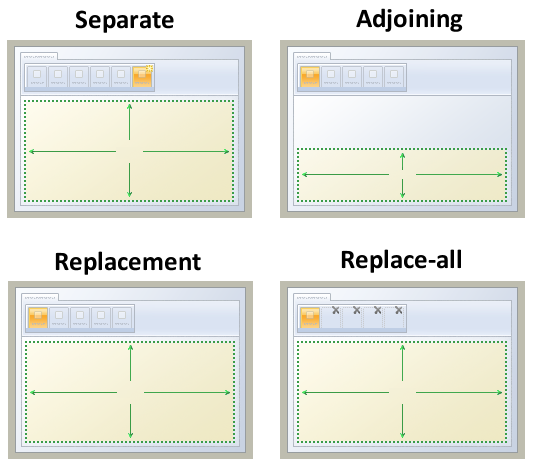 Bottom Navigation Pane: Docks the form below the Navigation Pane in Outlook 2003, 2007 and 2010. Bottom To-do Bar: Dock the form below the Outlook To-do bar. Top, bottom Reading pane: Docks your form either above or below the Outlook reading pane, if the reading pane is turned on. Right, left Reading pane: Dock the form to the left or right of the reading pane. Folder view: Adds the form to the Folder view. In the Inbox you’ll see a header with an arrow icon above the list of e-mail messages. Clicking the arrow icon will switch between your form region and the standard Outlook view. Dock Top, Bottom: Docks the form either to the top of bottom of the whole Explorer view e.g. If Dock Top is selected, your form will show above the standard Outlook UI, but below the Ribbon. Dock Right, Left: Similar to Dock Top, Bottom. But the form region is docked to either the right or left. With Add-in Express you can create context-sensitive Outlook regions. This means that you can specify that your regions are only shown when either a specific folder is selected or the selected folder contains only specific Outlook item types i.e. IPM.Note. The same goes for Inspector item types. This is accomplished by simply setting the FolderName and/or InspectorItemTypes properties. Add-in Express provides one feature for advanced Outlook form and view regions that knocks VSTO out of the water and that is the ability to give your user the option to dock your region by dragging and dropping it. 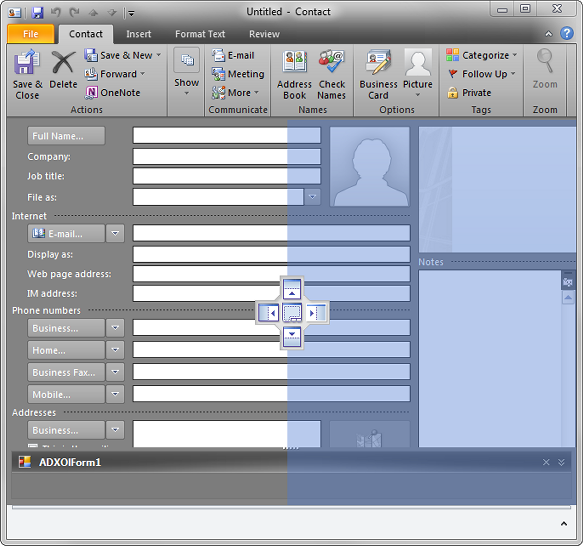 When the user selects and drags the advanced Outlook region, Add-in Express automatically displays a visual cue to the user indicating the available docking options as well as shades the region the user is currently dragging the region to. 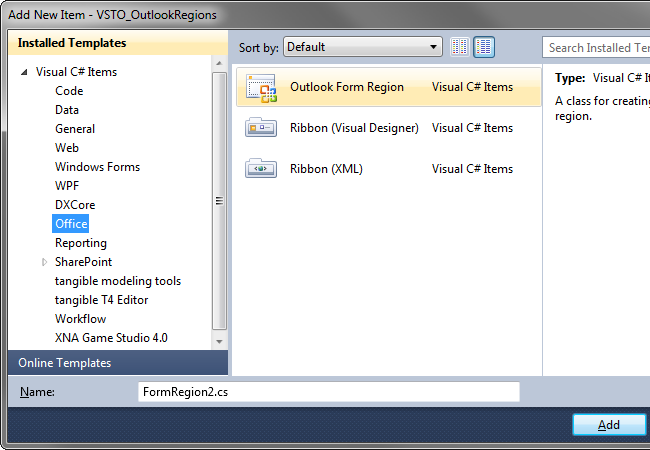 You are not limited to creating only one form per your advanced Outlook region. As illustrated in the screenshot below, you can host multiple forms per region. Add-in Express will automatically display an arrow icon, indicating to the user that another form is available. Developers can also enable the user to drag and drop the individual forms to dock it in the location of their choice. The Add-in Express regions are incredibly developer friendly and the developer has full control over the regions’ state (Hidden, Minimized, and Normal), position, size and visibility. It also takes care of storing the last state the end user left the region in i.e. Dock position, size and state. There is no need for the user to write code to store any user specific Outlook UI configurations. 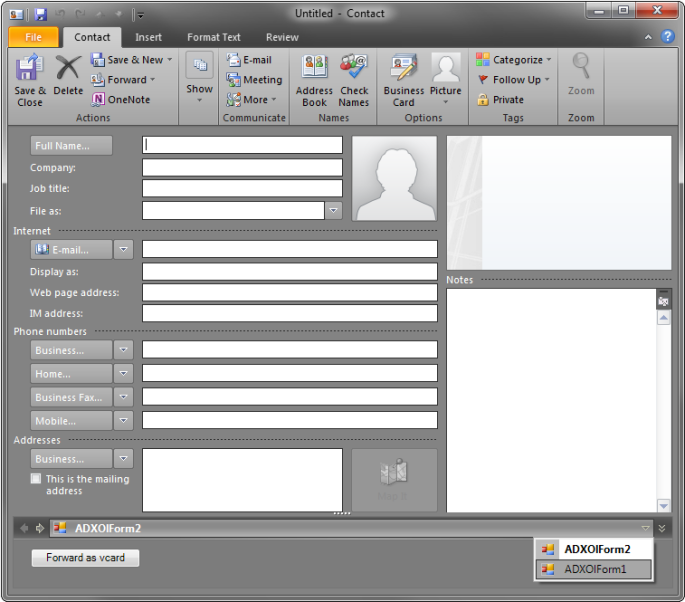 One final huge benefit of using Add-in Express to build your Outlook form and view regions, is that it will work in all versions of Outlook, from 2000 right up to Outlook 2013 as well as 32- and 64-bit. With all things considered, if you want to develop a commercial class Outlook add-in in record time; you need Add-in Express.